Here we Sisters are again to give you an update on our activities. We are now very busy preparing things for Christmas. We are giving religious instruction in kindergarten for children 4 and 5 years old. We enjoy going to this particular school because the principal and teachers are a delight. We give the class and then the teachers during the entire week remind them of all that we said and the children finish the homework we've given them. We are now preparing a small Christmas festival with the "Moo, Moo, Moo" song, which we translated into Italian. 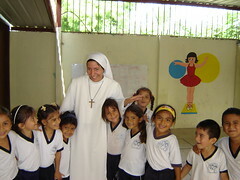 Now in Advent the director has asked us to have meetings once a week with the mothers of the children. At our school in Playa Prieta, Ecuador, we are nearing the end of the school year, and this means lots of paperwork, in addition to making and correcting exams. Furthermore there are First Communions, Confirmations, and activities with the different Confirmation groups. We have to ask priests to come to celebrate Mass and hear Confessions, organize the end of the year party for the children, a party with the teachers (next week), etc. For the weekend of the Feast of the Immaculate Conception (December 5th to 8th), the Servant Brothers together with Fr. 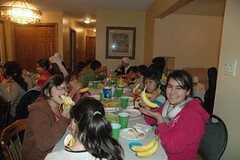 Higinio (a friend of the Home) arranged an encounter for boys, members of the Home of the Mother of the Youth. They met up on Saturday night in the "Santa Marta" House in Navalilla, Segovia. An man who, until a few months ago lived in the Sisters' home for the eldery, died on Sunday. As he was seriously ill, he had recently been moved to another residence. He died on Gaudete Sunday and we hope, in God's infinite mercy, that his encounter with the Lord has truly been joyful. He recieved the anointing of the sick before dying and we were able to pray the Divine Mercy chaplet with him several times. On December 8th, Solemnity of the Immaculate Conception of Mary, the Servant Brothers of the Home of the Mother in Nicaragua travelled to San Salvador (in El Salvador) to attend the priestly ordination of three Salvadorans. 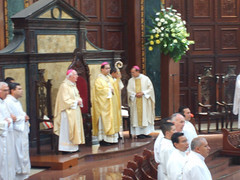 Two of them, Manuel de Jesús Lozano Estrada and Marcos Tulio Portillo Peña, had been classmates of Fr. Jose Javier and Fr. Reinhard at the Pontifical University of the Holy Cross in Rome. As December 6th was the Second Sunday of Advent this year, we could not celebrate the Mass for Saint Nicholas, the patron of our parish in Fabero, Spain. But, neither did we want this great saint to be completely forgotten. 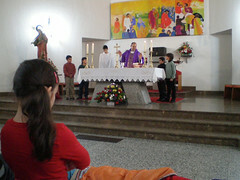 The children from the catechism classes preparing for their First Communion (in Spain, they are usually 4th-graders) enthusiastically prepared a little play that was shown before Sunday Mass that day. On Sunday, December 6th, the Servant Sisters of Ave Maria, Florida went to Immokalee to sing Christmas Carols at the local market. The people who live there are very poor and work hard. We wanted to bring them the joy of Baby Jesus' coming. On the occasion of the Solemnity of the Immaculate Conception, the Servant Sisters in Fabero held a meeting for catechists at our house, for prayer, discussion, and a cup of coffee. A beautiful bouquet of flowers for Our Lady filled the afternoon with color. From December 5th to 8th, we have had a wonderful get-together for girls in La Aldehuela, Getafe (Spain). About 180 people got together for the Thanksgiving Retreat held from November 27th to 30th in Fruitland Park, FL, located between Ocala and Orlando, at "Camp Lake Geneva". The Servant Sisters of the Home of the Mother became religion teachers to 800 students when, from November 16-20, they gave religion classes in "Cristóbal de Monroy" highschool. What better way to begin Advent than with the Holy Father? On Saturday November 28th, the sisters in Rome went with a group of girls to the Basilica of St. Peter's to celebrate the First Vespers of Advent with Pope Benedict. The Servant Brothers also attended the ceremony with a group of boys. Visit to the "City of the Popes"
Yesterday, Sunday, November 22nd, the community of Servant Sisters in Rome went with a group of girls to the city of Viterbo, which is called the "City of Popes" because it was the Papal See for nearly 25 years. Cardinal Antonio Maria Rouco Varela, Archbishop of Madrid, presented today at a press conference the new official website for World Youth Day 2011in Madrid. The Community of Servant Sisters in Getafe were present to record it and you will soon be able to watch the video on our site. At present it is only in Spanish. On the front page of "multimedia" the first video to appear is one produced by the Home of the Mother. The Servant Sisters of Getafe recorded the blessing of the new offices where all the organization of the World Youth Day will take place. On Sunday, November 15th, a get-together for the families of the Home of the Mother from Ascoli Piceno, Italy, took place. 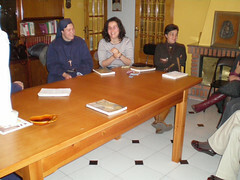 The sisters from Rome: Sr. Kristen, Sr. Anna Riordan, Sr. Emma and Sr. María Luisa arrived there on Saturday evening. A total of 4 families got together, some of whom are members of the Home, in the village of Monte Vidon Combatte. Those present were: Gioconda and Alfonso, Luciano and Maria, Giuliano and Rosella, and Angelo and Lydia.